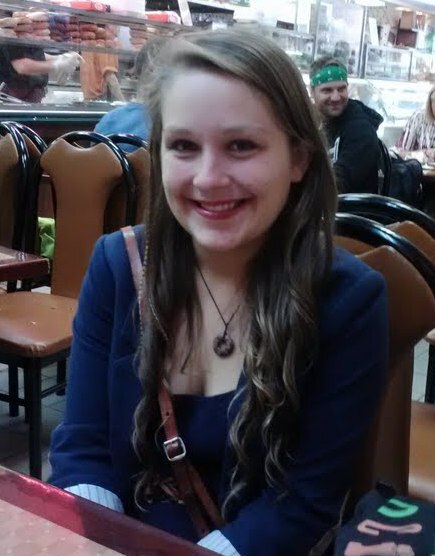 My curiosity was piqued when my colleague told me about his daughter, Emily Silver, who just returned to the United States from a semester abroad in Ghana, Africa. 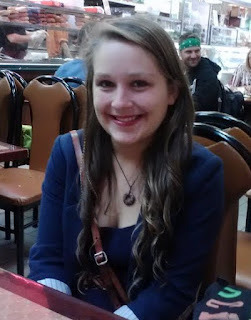 She is 21 years old, and a double major in Dance and Arts for Children, studying at The College at Brockport (NY State). She studied dance for most of her life, and now hopes to channel her childhood passion into a fulfilling adult career. After meeting her (and after hearing about her from her proud father! ), I asked to interview her for this blog, as she demonstrates much passion, not only for life and dance, but also about her time in Africa. Emily, what brought you to Africa? During this pivotal time in my life, I have done a lot of self reflection and come to recognize that my friends are my world, I am interested in the less glamorous walks of life, I enjoy finding hidden treasures and that I am a self proclaimed extremist and wouldn't have it any other way. I thrive off of challenge and I enjoy seeing, learning and exploring the path less traveled... I suppose that's how I ended up in Ghana. eventually seemed like a natural exploration for me to embark upon--even if it was a bit of a stretch, and certainly not the typical European trip most college students opt for. regions in and near Ghana, sleeping in the most remote rural villages literally straight out of National Geographic, and even eventually at my friend's house from my home college in Brockport, New York. What were your activities while there? Emily trying her hand at fufu! least, but once I was able to get past that, a whole new world of possibilities, friendships, culture, food and recreation was opened up to me. What appealed to you the most? resources, but there is no shortage of spirit. What appealed to you less? When first coming to Ghana I first interpreted the characteristic friendliness and helpfulness of the natives as aggression and forwardness. One of the major problems I experienced as a naive traveler was using individual experiences as my marker for generalized impressions. I would have one negative interaction that would then close me off to the more plentiful heartwarming experiences. Too many times, I believe I was rude and short with the natives because I was fearful of being taken advantage of, when their attempt at conversation and offers for assistance were completely genuine as Ghanaians generally are. My only regret is not softening my New Yorker hard shell earlier in the experience. Any "Africa" plans going forward? Ghana in a few years, seeing the friends I thought I'd never see again and hopefully seeing the development that Ghana can desperately benefit from. Nothing would bring me more happiness than reuniting myself with the piece of my heart that I definitely left there. While in Ghana, I also became really fascinated with the drastic differences in lifestyle, race, development and natural inhabitants between Ghana and South Africa. I am fearful that the seeds have been planted for my newest worldly curiosity; I doubt I'll be content until this curiosity is satisfied as well. Message to Americans about Africa? I appreciated Emily's thoughtfulness and the fact that spending this time in Ghana probably did not turn her assumptions upside down, as she already had an open mind and heart, but at least modified them. My hope is that many more Americans will visit Africa and realize that it is not as foreign as they thought. In the NY Times Magazine, another take on Africa, by a Maine native of a different generation, Monica Wood. After a couple of years on Twitter, I started following--or did he follow me? I don't remember!--@JuliusEssoka, who seemed to be living in Douala, Cameroon, and who was up at all hours, as he'd answer my tweets when it was late evening in New York, but in the wee hours of the night in Cameroon! When I returned to Cameroon in January, I hoped to meet him. He braved the ridiculous traffic jams that are now a mainstay in Douala, to come visit us in our Deido neighborhood. Julius Essoka works for MTN, in communications, by day. By night he is a talented musician. I brought back his CDs and mailed them to another African Twitter friend, Akenaata Hammagaadji, who has a weekly African music program: First World Music on @WVKR. Of course, first I listened to the CDs, and really liked some of the songs. I can't label them--some are Makossa-style, some reminiscent of African-jazzy House Music: it's quite a mix of styles. I interviewed him via email to find out more about him. Julius claims he has loved music since he was a baby. As per his bio, his dad would leave a Grundig tape recorder on when he was a kid, and he'd change the tapes to whatever caught his fancy. Later, he'd hang out at local "cabarets" and after a few years started playing in a band (one of the people he played with was Richard Bona, who now lives in the United States and got his U. S. start playing with Harry Belafonte, where my spouse and I first discovered him on a TV show). Between 1982 and 1994 he played with a variety of musicians, and went to Europe for the first time in 1994. Since 1998, he produced two CDs: Jokin’at home (1998) and Epass'i n’Epassi (2008). The next one is anticipated for 2013. At this point, he does not have musical influences per se, anymore, but he is inspired by those who remain wise and humble, despite having great career success. His collaborations are with old friends, who have become like family: the late Tom Yom's (in duet in Silane, he also wrote 2 songs for him; Lo dumea and Ebudu), Gino Sitson (also based in the U.S.) Fred Doumbe (who works with Les Nubians, amongst others), Xavier Mesa, and more. Julius' musical style: African in general. His philosophy is to enjoy life and to make others happy; to lend a helping hand to those in need. His other passions in life are writing (he wrote novels, poems and children's tales) and... sleep: he doesn't go out much, so sleeping is his pleasure! To hear some of Julius Essoka's music: http://juliusessoka.bandcamp.com/ (from Epass'i n’Epassi, my personal favorite). Meet him on Twitter @JuliusEssoka and on Facebook at Julius Essoka. 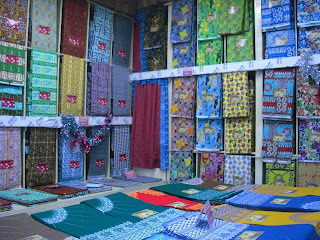 One of the first stops I made while in Douala was to buy pagne, African fabric, at R.W. King. Since a couple of years, women's clothing made with pagne is popping up in Saks Fifth Avenue and other upscale retailers' ads, at corresponding prices, in the many hundreds of dollars: Suno and Edun; in France, Toubab Paris. * In Edun's case, it certainly helps that a celebrity (Bono) and his spouse, Ali Hewson--are behind it. These trademarks have one thing in common: non-African founders, which is sad, as the same thing happens in all design fields, and often not only for Africans, but all "developing" countries: if the designer is African (or Indian, or even Chinese), she/he is ignored by major Western media or trade representatives (retailers, galleries). On the other hand, when finally Africa joins the rest of the economically wealthy world, and I am convinced the day will come, this will become be a moot point. 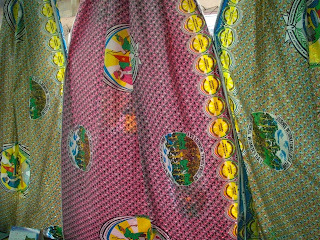 I often wore dresses made in pagne when I was living in Cameroon, and all the seamstresses in Douala are accustomed to making them. When I showed my spouse's cousin, who not only sews clothes, but also creates complete wedding environments (decor and dresses), the ads torn from the New York Times for Suno and Edun, she was flabbergasted at the prices! 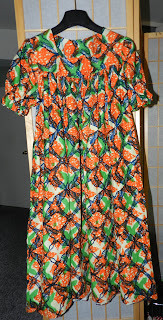 Of course I had to have at least one dress made, although I wasn't ready to pay for Dutch "wax" at a much higher price point than Cameroon-made fabric. 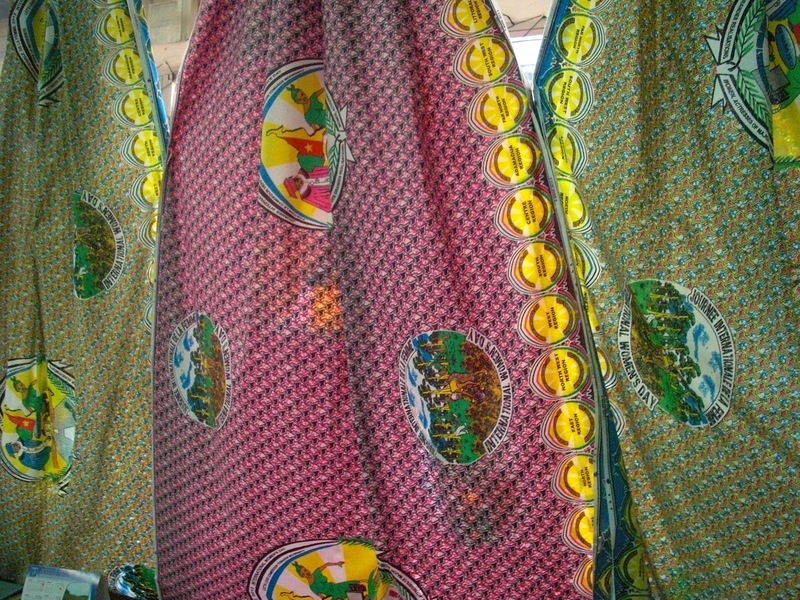 The "wax" holds out better to the strains of time, but not only is it expensive, the designs are better-suited to a specific African wardrobe than for a Western-style dress. R.W. King was one of the outposts of the European "comptoirs coloniaux," trading outposts that have their roots all the way to the Phoenicians with Carthage, in North Africa. 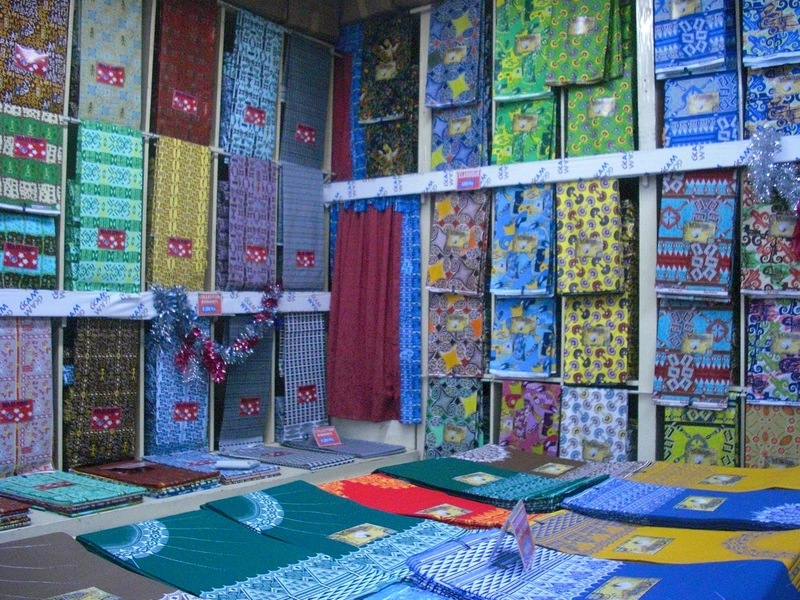 They were used to import fabrics and more to Sub-Saharan African countries, and exporting raw materials to Europe. It's such an old-fashioned business that I couldn't even find an R.W. King website. 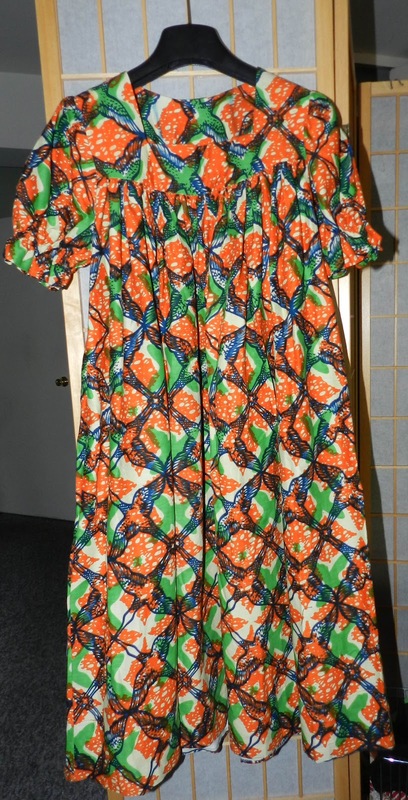 I returned from Cameroon with my own dress, as yet unworn because of the cool rainy season we've had in the Northeastern United States. 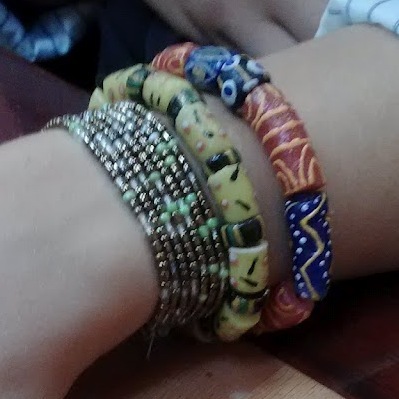 Below are a few more photos of the Douala traditional kabas and mini-kabas, easier to wear for daily life. French Wikipedia: http://fr.wikipedia.org/wiki/Comptoir which includes a reference to the slave trade. English Wikipedia: http://en.wikipedia.org/wiki/Trading_post?oldid= with a focus on Northern America. Fah-Schyon blogs about fashion in Africa topics. * Toubab (or Toubob) is the word used in West Africa to name people of European descent. The first time I ever saw this word was in Alex Haley's Roots (the book)--my first introduction to Africa south of the Sahara, so long ago!